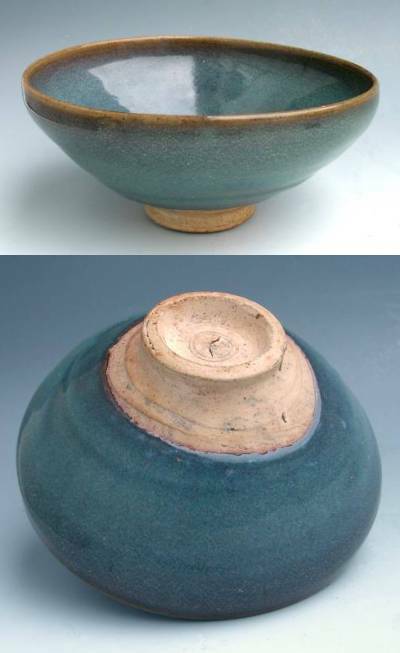 The Jun glaze is a complex blue glaze which was developed in Henan province during the the Northern Song and Jin dynasties, occasionally with red streaks. Jun wares have their name after Jun zhou from where it originated. The old kiln site is located in the present Yuzhou City (Yu county) of the Henan province, which was once under the administration of the Junzhou (Jun prefecture). The Jun glaze is renowned throughout the world for its flamboyant appearance as a bright blue glaze. Technically, it is an unusual type of glaze in that it is not a blue glass at all. The color in jun is due to reflected light caused by the glaze structure being opalescent; the minute bubbles and phase separation of the glass as it cools gives an opal effect resulting in a vivid blue appearance. The glaze itself when examined through transmitted light is actually yellow. The Jun kiln made use of iron and copper colorants to fire an opacified bluish glaze with variations such as light sky-blue, or moon-white and red or purple splashes. Normally the glaze was applied to a biscuit body. The firing of copper red in a reducing atmosphere was an invention by the Changsha potters in the Tang dynasty. The Song Jun potters developed it further, adding one more variety to the family of high-fired green and black glazes. The success of the Jun copper red laid the foundation for the fresh red (xian hong) glaze achieved in Jingdezhen during the Ming and Qing. During the Jun and Yuan dynasties, many kilns in the Henan province manufactured Jun ware and many kilns in the Hebei and the Shanxi provinces produced its imitations. The production increased dramatically in the Yuan dynasty and many large vessels were fired. However, the body was coarser and the glaze often stopped halfway downwards on vessels such as dishes and bowls. One characteristic of Jun ware is the earthworm-track markings on the surface of the glaze, which rarely occurred on later imitations. According to the tradition the Jun bowls were made only for the court during Song times. All pieces not delivered to the court was said to have been smashed up. Only during the following Yuan dynasty, pieces with Jun glaze was told to have become available outside of the Imperial court. Excavations of the Baguadong and Juntai kiln sites during 1974-75 has proved that the former was the kiln that fired tribute wares for the use of Emperor Huizong of the Northern Song. From the late Jin to Yuan Dynasties, some kilns in Hebei, Shanxi and Inner Mongolia also began to imitate it, forming a family of its own. Jun has been widely copied in China and Japan up until today and is also one of the most difficult types of wares to authenticate. The real ones, still separates themselves from the copies in several ways. One characteristic of Jun ware is the earthworm-track markings on the surface of the glaze, which rarely occurred on later imitations and many pieces are finely or even coarsely pitted. The technique of yaobian was often used, which refers to changing the tints of colors by controlling the temperature of the kiln. A number of Jun ware vessels, mainly the bulb bowls, flower pots and stands, bear Chinese numerals stamped into their bases under the glaze. These numbers have been the subject of many scholarly debates. The numbers range from one to ten, and judging from the examples in the major museum collections and those examined from the excavations at Juntai, Yuxian, the numbers relate to the size of the vessels. Ten represents the smallest size and one the largest. Remaining theories of the numbers relating to pairs, decoration, the ordering process or for to be useful in the palace storerooms, this does not appear to be borne out by extant examples.